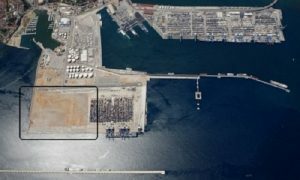 The Board of Directors of the Port Authority of Algeciras (La Autoridad Portuaria de la Bahia de Algeciras, APBA), Spain, last week approved the basic conditions for Total Terminal International Algeciras (TTI Algeciras) to use the Phase B land plot of Isla Verde Exterior in order to expand TTI’s operations in the port. According to the port’s press service, this decision was made in response to the corresponding request from TTI Algeciras, which is wishing to evaluate the feasibility of enhancement on the Phase B, adjacent to the land on which TTI operates since the summer of 2010. The APBA President reminded that in the initial concession granted to Hanjin as the owner and operator of TTI Algeciras, the company had a preferential option over the aforementioned Phase B land plot. However, the bankruptcy of the South Korean shipping line forced the APBA to put the Phase B area on the public tender. Port.Today has been closely following the topic of the Phase B development at Algeciras. As we wrote earlier, the international public tender to select a suitable bid for the concession to construct and operate a container terminal at Phase B of Isla Verde Exterior was announced on 1 August 2016.The area of 30.5 ha (37 ha including the public zone) included the quay of 18.5m deep and 680m long, with a possibility of additional 130m to reach a total quayline of 810m. During the following 1.5 years, the bidding deadline was postponed several times until finally the last extended term expired on 31 January 2018 and as no bids were received after all, the APBA decided not to prolong the tender any more. 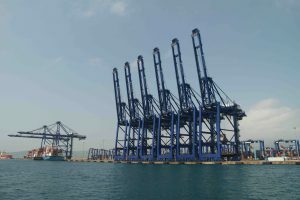 The existing semi-automated terminal TTI Algeciras with the capacity of 1.86 mln TEU has been lately sold to the South Korean shipping company Hyundai Merchant Marine (HMM).